I am a huge fan of the cheeseburger, I often joke that if I had to choose one item to eat forever this would be it. So I was kind of excited to make it over to I Love Burgers, I mean the title says it all. They are located in the back of Town Square and could easily be missed, since not a lot of things are open right by it. This is the type of place where you order when you walk in then you pick your seat and the food will be delivered separately, I thought it was an actual sit down restaurant so this was a bit of a surprise for me. The menu is pretty straight forward, the only thing I found interesting was that they had columns for pricing they had a classic & more to love, I had to ask what the difference was because there was no information. Turns out the classic is a 5 oz patty and the more to love is a 7 oz. You would think this would be on the menu and it wouldn’t be something we would have to ask, but maybe that is what they ultimately want for the customer to ask questions. They did have a pretty decent selection of burgers as well as meat choices, you can get chicken, salmon & veggie. They also have a variety of shakes, that I was able to watch get made from my seat and they all looked delicious. I was focused on the burger so I didn’t order one, but if I go back I will give one a shot. I went for the Inferno Burger; angus burger, pepper jack cheese, roasted jalapeños & habonaro-jalapeño mayo. I must be a kid a heart because I couldn’t resist getting tator tots on the side. If you are looking for a spicy burger this is for you, but I was disappointed that the jalapeños that topped the burger were not actually roasted like they were described on the menu but were actually raw. I ended up picking off pieces of jalapeño because it was overpowering everything. I couldn’t taste the meat, mayo or cheese because all I got flavor wise was jalapeño. Now I know ordering a burger that is covered in jalapeños it would taste like them, but when basically all I am eating is jalapeños it really distracts from the actual meal. If the jalapeños had actually been roasted this would’ve been better and actually enhanced the burger. Plus the roasted jalapeños would be a bit tamer and sweeter in a sense which would make it more palatable meal overall. The tator tots were cooked perfectly and really helped when I needed to cool down my mouth. My friend went with the standard which was just a basic burger with lettuce, tomatoes & onions with a side of the natural cut fries. 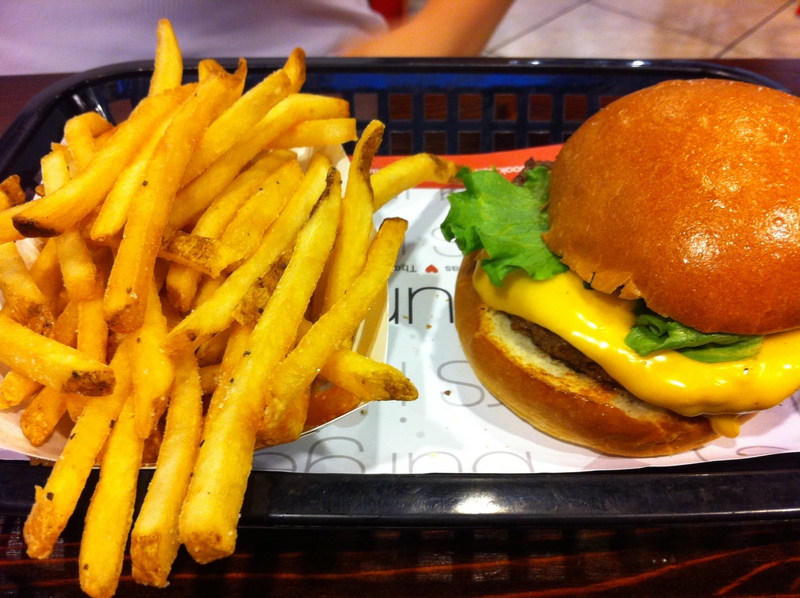 I didn’t try any of the plain burger but it looked really good, and my friend enjoyed it. The fries were cooked perfectly also. But truthfully this place is nothing special. I wouldn’t go out of my way to go here, but if I was in the mood for something casual I would certainly not be turned off of going here while in town square. Overall I will say that it is a bit pricy for what you get. 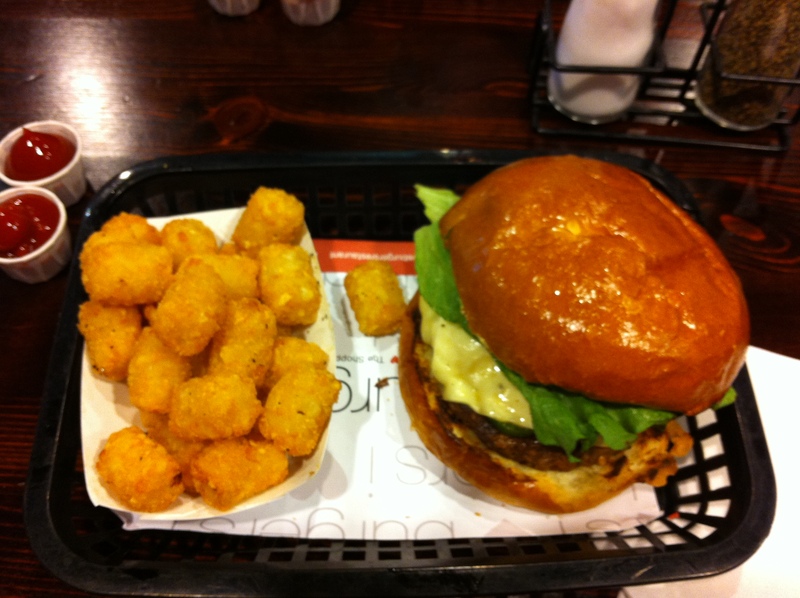 For my 7 oz burger the cost was $7.99 and to add the tots & small soda it was an additional $4.00. So it made my total meal $12.96 w/tax. Considering that it is “fast food” I am not a big fan of spending $13 on my meal when I can go to a drive-thru and get basically the same meal for about $5 less and get a way bigger drink. That being said I do think that I will go back because I would like to try the I Love Bacon burger because it sounded interesting and a bacon lovers dream and maybe it is what I should’ve went with from the beginning and maybe my trip would’ve been better. I would say that if you are in the neighborhood and want something fast, because in town square there are limited choices on fast food, this would be a decent choice. Overall it had potential to be a good burger and I would think it is worth a second chance. I agree with the pricing. Esp for just a burger and the fact it is all al’carte (sp) but I have had their shakes and they are delicious but I would go to 5 guys for a burger if I really wanted one. Sweet potato fries are good and i would get over their tots and standard fries.